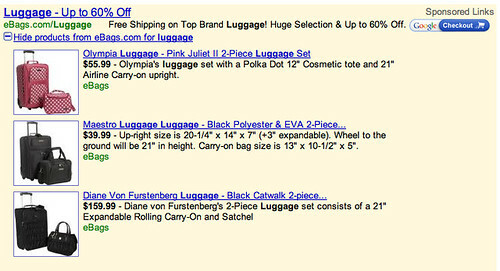 Home > Google News > Google AdWords > Google AdWords "Show Products From ..." No Longer A Test? The same shows up on the right hand side of the search results for many other keywords. I believe the requirement is that you be an advertiser at Google and have product in Google Base/Shopping. Now, Google has been testing this since November 2007 and continued the tests again in January 2008 but now it seems to be showing up for many searches and for many searchers. So this might not be a test anymore, this might be the new standard to make the ads more interactive and possibly more useful. I am not sure if clicking on a product link will cost the advertiser money, I would assume it would, but I have not confirmed this. Forum discussion at WebmasterWorld and thank you Nick for pinging me on this. As part of our ongoing commitment to innovation and helping users find the information they're looking for online, we are testing a feature called the AdWords Product PlusBox, intended to help make information about specific products more easily accessible. For ads associated with products in Google Base, a plusbox can be expanded to display relevant products from that advertiser. The plusbox provides users with more information about an advertiser's offering even before clicking on the ad, and offers advertisers a new way to engage potential customers. This feature is currently in a limited beta with a small number of advertisers.